In Sunday’s Premier League match between Liverpool v Chelsea, Luis Suarez was involved in two controversial incidents. The first was a blatant handball in the box to give Chelsea a penalty. This was followed up by him biting Chelsea defender Branislav Ivanovic. He is a player that is no stranger to controversy as well as not being a stranger to purposeful handballs in the box and biting players. 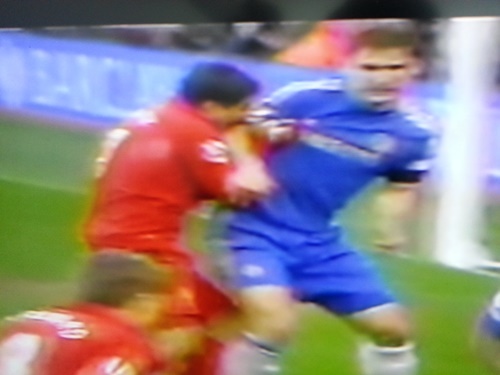 Check out the video below of Suarez biting Ivanovic today. While playing with the Dutch team Ajax, Suarez was involved in biting an opponent for which he received a seven match ban. 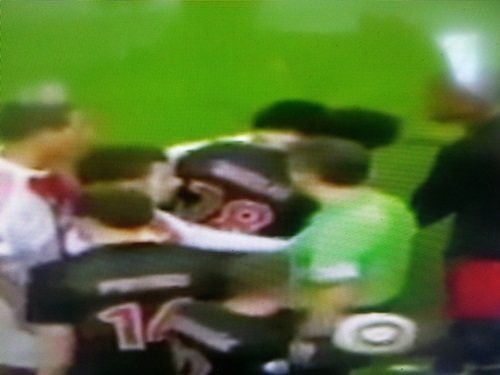 Luis Suarez bites Ottman Bakkal while playing with Ajax. This time around, he should receive a significantly longer ban extending into next season. However, it remains to be seen as to whether it will make it into the referee‘s post game report or not. If it does, then there will be no punishment. If he receives no punishment, then video technology needs to be looked at more closely for use throughout these matches.